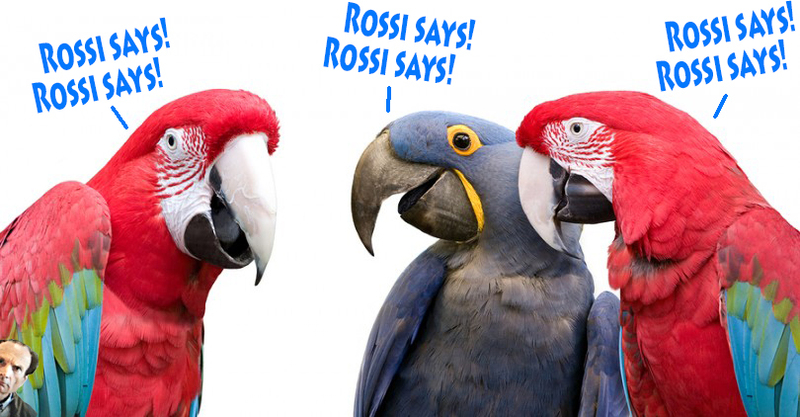 As well, any resemblance between Planet Rossi and the dead parrot sketch is purely coincidental. Purely. No resemblance, no. Move along now, continue reading below. List of RossiSays posts on LENR Forum. To see hundreds of them, however, go to ECW. And, of course, there is the ever-informative and reliable source of RossiSays, with obvious socks asking questions that Rossi wants to not comment on, except when he does, the popular peer-reviewed Journal of Nuclear Physics . It was a very visible phenomenon up into 2016, RossiFans would scour every word Rossi wrote, looking for clues to the future of RossiTech. The barest hints were parsed until they were a dead parrot. Ooops! An allusion to the dead parrot sketch, so obviously irrelevant. It is still happening, mostly now with Quark-X. Rossi v. Darden is a mere annoyance, for Rossi, having presented a veritable mountain of doo evidence, — 685 exhibits, compared to IH’s pitiful 251, now must have, for any fair jury, the total preponderance of the evidence. Especially by weight. RossiSays. It seems The Weasel is rewarded for his relentless posting in the form of some shares in a IH subsidiary. The accountant of Cherokee (Wendy Carter) gets a lousy 50K shares. LENR, it’s (still) a man’s world. Referring to Dewey Weaver as “The Weasel.” Supposedly mods are trying to keep the zoo clean, but there is an elephant loose with diarrhea. “Relentless posting.” This accusation is common among Rossi supporters, about those who criticize the Planet Rossi world vie. Weaver is not the most persistent poster on LF, by far. Check out IH Fanboy. IH Holdings International, Ltd. is an IH subsidiary. The reverse is true. IHHI is paying for blog comments. There is zero evidence of this. There is something smelly about the assignment of shares in IHHI. Carter is not complaining. Claims are made without verifiable evidence. The claims are irrelevant to the topic of the thread. There is a hint that Cherokee and IH are the same. “Weasel” is a slur, irrelevant or unsubstantiated. Weaver is not the most persistent poster on LF, by far. Check out IH Fanboy. The company is IHHI. Filings for IHHI may be viewed here. The image WCG shows is from the Resolutions filed 26 Apr 2017, referring to the Award agreement 31/03/2017. The shares were actually allotted on 31/03/2017. This is 1235079 Series B shares, par value $12,351 total, and it appears that these are paid-for shares, i.e., the named persons bought them. These are not, apparently, noncash compensation, as was implied (i.e., that it was payment for work). So Carter actually paid $500, Weaver paid $750, Fogelman paid $2,500, Vaughn paid $4,300, and Darden paid $4,300. This might be an incorrect assumption on my part, but it is based on my reading of the documents. Series B shares are restricted. They do not have voting rights, but may received dividends and distributions. IHHI is the sole owner of Industrial Heat, having purchased all the original shares for shares in the IHHI entity. IHHI was formed as an actual “U.K. entity” at the request of Woodford, to receive the $50 million investment in May, 2015; the plan had been to reorganize in the Netherlands. (See the Ampenergo notes.) If any reward is involved here, it would be that the right to purchase shares in IHHI is not ordinary. IHHI shares are highly speculative, may never show any return, and may be completely unredeemable. Buying them is close to a donation for research, with a small possibility of huge returns, like a charitable organization’s lottery tickets, only with a far larger possible payoff. The claim of paid FUD is common on Planet Rossi. It has certainly been claimed about me. I have not been paid to blog, by anyone, ever, nor has any payment been promised, other than promise of coverage of out-of-pocket expenses (and that not from IH or anyone related to IH, so far). I am familiar with the circumstances of others about whom this claim is made, and while it may not be utterly impossible, it is extremely unlikely. People pay for value, and there is no value in blog comments other than to the blogger and maybe the community. Blog comments will not influence court deliberations — to any material degree. Outsiders, not involved and not knowing what is actually happening, are imagining misdemeanors or offensive actions. WCG provided no link nor even specific information that would be useful in finding the source. Yet he was probably looking at the source. How difficult would it have been to add a link? Not difficult! But Planet Rossi is not about verifiability, and claims without evidence — or even sometimes contrary to evidence — abound. IHHI is not a party to the lawsuit. So this is not a “Rossi v. Darden development.” Rossi has attempted to connect the Woodford investment in IHHI to his technology, and it is obvious that IH’s willingness to take a major risk with Rossi was a Woodford consideration, but it is also obvious that Woodford was not investing in Rossi, per se, but in IHHI, understanding that the $50 million would not go to Rossi unless something opened up, and that it would go to diversification of the supported research or IP investments. Woodford reportedly found Rossi to be a “crazy inventor,” and “cagey.” See the Amperergo notes. There are coincident officers between Cherokee and IH (now IHHI). Cherokee, however, is not and has never been an owner of or investor in IH or IHHI. Darden may have gained entree to Rossi by being the CEO of Cherokee Investment Partners, that is plausible and may even be supported by evidence, but IH was obviously formed to keep the companies (and associated liabilities) separate, and the License Agreement was explicit that any outside representations were not to be relied upon. We may not know exactly what was said, but it’s clear that Rossi regularly misinterprets conversations (including what he, himself, said — or he lies about them). The representations in WCG’s post are common and are repeated over and over, no matter how many times facts are provided. That is a clear sign of “Planet Rossi,” a constellation of “facts” that support a particular narrative, while the parrot is actually dead. Ah, there I go again. Okay, I was being sarcastic. It’s related. Remember, at my age, Vitamin F becomes critical to survival. Fun. The web of shells in itself is quite astounding. All for a technology that supposedly doesn’t work. The IHHI operations are presumed to be about Rossi technology, when, in fact, that was only a major element, now essentially obsolete, apparently a dead parrot. This is assumed to be contradictory. And if something appears contradictory, someone is lying. If IH has concluded that the E-cat doesn’t work, but doesn’t immediately surrender the license for $12.50, (something useful for something useless, a good trade! ), they must be lying. The structure is not complicated. The full set of investments by Cherokee and persons with some connection with Cherokee is very complex, but most of it is utterly irrelevant. Individuals choose to become investors in a particular LLC (if they are allowed, these organizations require qualified investors, not people tossing in their life savings, and they don’t have to accept just anyone, the shares are not publicly traded). IPH was originally formed to hold IP (i.e., licenses), and this may have tax implications; LLCs often present legal tax savings opportunities. So now, there is a simple structure: IHHI owns, entirely, IH, which owns IPH, entirely. Everything else that might be formed is independent, though these organizations may have some coincident officers, they also have separate share structures and ownerships. They may also enter into defined business relationships with other organizations, as, for example, with Lenuco. IH’s major investment was indeed in Rossi technology, over $20 million. However, that had reached a stalemate, and IH allowing Rossi to run Doral was a last gasp, giving Rossi a last chance. While Rossi has claimed that Woodford invested because of seeing the Doral plant, the truth appears likely to be quite different. Woodford was not impressed, even if they were quite polite, and everyone involved attempted to be polite to Rossi, to not “piss him off” as Cassarino noted in his Ampenergo notes. Woodford made sure that their $50 million went, not to IH, but to IHHI, in the U.K., where, if there were problems, they could readily intervene. We will see on Planet Rossi the trope that this “went into Darden’s pocket.” But it didn’t. It did come under Darden’s operational control, but with clear legal obligations to respect the purposes of IHHI. Darden did not rise to his position as an investment manager by stiffing major investors! Haha, yes. And it would be very unfair to reward your staff with Monopoly shares. JT Vaughn would fall for it, but the accountant? IH is ridiculous and unfair. Shares in IHHI are “Monopoly shares,” i.e., worthless in real life. Vaughn is stupid, the accountant (Fogleman) must be as well. If they are, it isn’t showing here. The shares are not a “reward” to staff, though permission to buy some might be. Carter is presumably staff, but Weaver isn’t, he is an independent contractor, and has his own money that he invests, including in IH from the beginning. IHHI shares are highly speculative, that is disclosed; however, if the IHHI business plan pays off — the odds of that are very difficult to determine — IHHI could end up being worth a trillion dollars. Okay, let’s say it’s $100 billion, and that is not far-fetched. A trillion would be owning the whole LENR market, if commercial products are created as may be possible. Just not with Rossi technology, or … unlikely with Rossi technology. So the IHHI shares, costing $0.01 each, and with 26 million shares outstanding, could be worth $3800. So, what is the chance of IHHI being in a solid position to identify promising LENR technology and invest in it? I’ll give it 10% (given my understanding of LENR; and if anyone can do it, IH is likely to succeed). So the expected value is roughly $380 per share. For $0.01 each. Wendy Carter would have an asset worth almost $20 million. Less taxes, of course! I’d jump for the chance to invest, and would simply confine my investment to what I could afford to lose; and my kids would be the ones who might see the return. Or not. Monopoly money, not. In a variation on an old saw, if they are so stupid, why are they so rich? Lucky breaks? What? Venture capitalists take risks, knowing that some of the ventures will fail. People who don’t understand then think that a failure proves they made some horrible mistake. That is not how this kind of investing works. It may usually fail, but when it pays off, it can pay off big, very big. So if they make sound estimates of probabilities and don’t bet the farm on something stupid, impossible, and, in fact, don’t bet the farm on any individual investment, they can steadily and overall make money, bundles of it. Planet Rossi thinks they do this by deluding and misleading investors, and pocketing the investments. They think that quite in the face of evidence. Malfeasance does occur, but it does not turn out well for the bad actors. Can you explain us why you posted a text regarding RU-486 abortion pill and a guy called PIKE in this forum ? And just to refresh Andrea Rossi was cleared by all accusation in Italy and refunded by the State. Your last jpg seem a list of companies related to IH . What is mysterious is FUD, (commonly claimed to be paid). I researched that Ahlfors post. On the face, it is Planet Rossi polemic, though subtle, which then makes it remarkable that ele calls it FUD. The Planet Rossi theme is that IH is a bunch of crooks. The Ahlfors post appears to have been deleted, which is a bit odd. Misc Mash covered it. There is no sign of Ahlfors being on a FUD mission, though he is definitely stirring the pot. Joe Pike is a major investor in IH, see Pike history. This is not really relevant to the thread, because Pike is not an officer in IH, and people who have made mistakes (as Pike did, and he was also convicted of forgery for an offense in the 1980s) are not screened out as investors. The RU-486 story was about his involvement with the introduction of RU-486 into the United States, where Pike had not disclosed his (then recent) past. So this was relevant to the general topic of IH and people being convicted of fraud or something like it. I don’t think that Ahlfors was claiming that Rossi was a convicted fraudster. So ele probably did not understand. Rather, Ahlfors was pointing to what could be evidence that such claims were hypocritical. There were two more images. ele did not cleanly identify them. They are covered in the Misc Mash post. … there are many posters here that accuse Rossi just to “create an opinion” and poison the Jury of the trials, but I think sincerely that Jurors will be much more intelligent then IH thinks. They have no reason to read all the trash and insults posted here. the motivation of those who “accuse” Rossi of something is to “poison the jury of the trials.” These people are “IH,” or working according to an IH agenda. There are many small Rossi tropes in this, the way language is used. IH thinks that posts here will influence the jury favorably to them. As there is a lot of money possibly at stake, this then creates a possible motive for spreading FUD. As many have explained, the likelihood of a prospective juror having seen any of this discussion is very low. Further, some think that jurors, knowing they will serve on the trial, will research Rossi, etc. However, jurors, until selected, do not know what trials they might serve on, generally. They are interviewed in panels, the process is not as stupid as some imagine. If they look it up during the trial, they will be violating explicit court instructions. Few will do this. IH knows all this and would not pay for senseless stupidity, unless there is a way to make a trillion dollars with it. (I.e, they are indeed willing to take risks, but not ones with such a low payoff. IH is quite reasonably confident that it will not be found liable for $89 million and triple damages for fraud, and the other issues — around their counterclaims — simply are not that important to them. One more consideration: if they were actually attempting to influence the jury, sanctions could be severe, I think that is a criminal offense. Doing that would be a clever way to lose big. Rossi is claiming that the Weaver letter to Bo Hoistad was such an attempt, even though the evidence simply does not match that accusation. But what if there was actually an email or even a witnessed conversation where Dewey was asked to do this? They’d be screwed. This Planet Rossi trope requires believing that they are totally dumb. Maybe like Fabiani. I’ll come back with more. The little goal here is to compile a list of Planet Rossi tropes, idiosyncratic ideas found with high frequency in a certain population. That same process could be followed, longer-term, with cold fusion pseudoskeptics, believers, and any other community that develops “common wisdom” that isn’t. Meanwhile, I want to get those parrots up. Enjoy. So: I post on LF to some extent as a sort of Abd minor. I am not quite as prolix as Abd, I don’t do the depth of legal document research (too boring for me, I only do that sort of excessive detail on tech stuff, and the fun now is all in the legal decoding). As with Abd, I am disliked there for being (along with sigmoidal) as Rionrlty says – untrustworthy because too rational and bombarding people woith facts, instead of making heartfelt short statements that show clearly my motivation. As sig and me, so Abd here in spades. Abd is super-untrustworthy to guys like RR because he cares much more about facts than fans and has at times the internet interpersonal skills of a gerbil (sorry Abd, and not that I think you don’t do a good job here). To round off this slightly snarky comment: I am very impressed with Abd’s collation of the legal stuff here. I don’t think he gets the credit he deserves. It is so much work to wade through that stuff and check summaries against actuality. Abd will perhaps reckon that he is doing unpaid what JD guys are paid 6 figure sums to do. Gerbil, eh? I love rodents, have one sitting a few feet from me, a rex rat. My daughter taught me how cute, affectionate, and smart they are. And then they die, five years is really old age. Thanks, THH. We may disagree on many things, but I also have a strong suspicion that, with some work, we can find consensus. The mass of legal documents is overwhelming. It’s causing domain host problems. As long as I’m the only one working on creating study resources, it will remain limited, but “limited” may be better than nothing. Over all I think its between Ih fanboy and Jed Rothwell for most comments on LF.Mind you its not much of a study. I did one last check and Old guy is ahead of them all with 60 comments. Sam, my first reaction: Thanks. Actual facts. Second reaction: give the parameters for your search so that later someone — if they care — can check it. Start date and end date would do it. But it doesn’t really matter to the point here. Some people are personally motivated to comment, some are even obsessed, and it’s just normal on the internet. LF software, unfortunately, does not allow creating hierarchy of posts. It is a discussion board and is not designed to create useful content from discussion without massive additional work. There are what would be comment threads using different software, but scattered and only followed with difficulty on LF. WordPress, for this, is not much different. I’m used to the tools of MediaWiki, where this is far easier. My biggest complaint about LF software would be that analytical tools are missing, and logs are primitive, and the work of moderators cannot be tracked easily, so the community cannot watch the watchers, and that is the answer to the old question of who watches the watchers. We do. That ancient conundrum is only a problem when government is executive rather than advisory, and transparency is missing. I am looking at WordPress plug-ins that will create administrative logs, allowing the community here to monitor admin behavior. External tools or procedures can allow recovery from abusive deletion, etc. Setting up off-site appeal processes also can overcome software limitations. So far, we have no complaints! Just one or two trolling posts, plus, of course, as anyone would expect who knows blogs, tons of spam. Some of it is hilarious.